Best-selling author and former camp director Dave Burrow has assembled the greatest book of Christian camping insider secrets, shortcuts, and ideas ever presented––over 989 specifics from which to choose, use, or make your own––360 power-packed pages of practical, down-to-earth “use-it-now” type information. Whether you are starting a camp from scratch or just want to see your camp flourish, this resource is for you. Now you can have an immediate answer to anyone who asks about any phase of your camp ministry. Create effective camp brochures and direct-mail letters––learn who to send them to and how to follow up. Use it to plan your camp year––including how to have a financially sound camp. Develop statements of purpose for your board of directors––you’ll even be able to submit a complete camp program down to the last detail. Save money in your camp operation, figure costs properly, and purchase products and services like a pro. Supervise your camp like a fortune 500 executive––and have a successful working relationship with your staff. Recruit counselors and staff––and train them to be effective. Have a safe camp––safety checklists to cover all the basics. Have a healthy camp––including 27 ailments any camp nurse must be able to handle. Have a “five star” kitchen––full of menu options, economy dishes, and 10 yummy and wholesome snacks you’ll want to carry in the camp store. Use your facilities in new ways during off-season––ideas and ministry expansion cautions. Do you know how much sleep is needed for staff and campers? Find out what studies say. Learn the 9 specific goals that you should achieve with each camper. Discover camp discipline that works––for staff and campers. Create a successful “theme camp” that will leave an unforgettable impression with your campers. Establish an effective music program and avoid mistakes that could cost you your camp ministry. How to build a nature trail––what to include and how to clear it. How to create fun signs that educate and instruct––and last from season to season. 5 nature-related activities for the whole camp or cabin group. A full one-year complete camp plan including a checklist of what to do each month. A 64-point checklist for pre-summer opening. A cook-out menu for groups of 10 or more. A suggested menu for your camp for one week. A 56-point checklist of suggested kitchen equipment for the feeding of 100 folks. Six pages with 143 separate items are jammed into this comprehensive index. Find what you need fast. 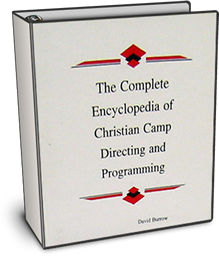 All the major options that you can possibly find are put right at your fingertips in The Complete Encyclopedia of Christian Camp Directing and Programming.